Paint a picture in your mind, write it down, achieve a goal. Sounds simple doesn’t it. In our last post we talked about painting a vivid picture of what we want to achieve. Make it bold and brash and add details about the people and things that will help you make it a reality. This is a tried and true way of creating a vision to complete your goals. But what if you can’t paint? You have the canvas, brushes, and paint but you can’t get it on paper. You have an idea in your head, but when you try to draw it on the canvas, it doesn’t come out right. Soon the paint is flowing in an abstract manner and your painting ends up half finished with dabs of paint all over the place. When I was a kid I admired my dad’s artistic skill. As an artist, he could draw and paint amazing things with ease. When I would try to draw the same thing, the lines wouldn’t work and I would soon get frustrated and give up. One Christmas he gave me an amazing gift. I opened a package and there it was… a paint by number art set. The only difference between this set and my blank canvas was that the lines were drawn in for me. These simple little lines made all the difference in the world. All I had to do now was match the number on the painting to a paint color on my pallet. I would dip my brush into the proper color paint and fill in the space between the lines. It was simple and soon I had my own masterpiece. I was truly amazed at my creations, and these paintings soon hung on my wall for all to see. The great thing was the numbers and lines were painted over so nobody knew my little secret. As I painted more and more I was soon able to add my own flair and the lines became less important. The lines and numbers added structure and guidance. When we look at our lives and our life gallery we may find that we need some structure and guidance too. We need someone to draw the lines for us and put the right numbers on our canvas. Did you know there are many people that are doing just that? Fitness: Body for Life. This book offers a step by step twelve week plan to help you get in great shape. The plan consists of three main components, aerobic training, resistance training, and a sensible eating plan. I went on this plan a couple of years ago and lost 25 pounds in 12 weeks. The plan is pretty straight forward, doesn’t require a lot of equipment, and really produces results. The plan took a lot of effort, but when I looked in the mirror after twelve weeks I was amazed. Just like my paint by numbers pictures as a kid, I had created a great picture. In this case one that had muscle instead of fat. Personal Development: Toastmasters. Take a year and make a commitment to join Toastmasters. In this time with the step by step communication manual, you’ll give 10 speeches, which will transform your life. You’ll soon lose your fear of public speaking and find more confidence in group situations. In the last two months of the program add two leadership projects and speeches and you’ll round out the year a more confident leader and communicator. The cost for this helpful program is around $100 for the year. All the lines are drawn in for you, you just add the color and paint the picture. I can say this simple step by step program radically changed my life. I went from a very shy person, to someone who welcomes the public arena. And the program continues after the first year to take you from a confident speaker to an accomplished one. Find a club near you and start painting your leadership picture today. Computer Learning: Microsoft Step by Step Books Do you need to learn new computer skills on your job? How about setting aside a short time to learn a new program. You can easily become proficient in Word, Excel or Powerpoint in just a few weeks with these step by step guides. 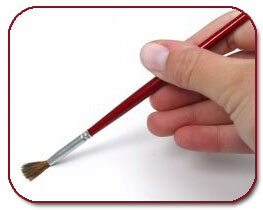 The lines are all painted in for you in the form of easy to do lessons. I love these books because they give you hands-on training and they really cover about 80% of the things you’ll ever use the program for. You’ll be amazed at some of the cool things you can do with Word, using the built in outliner and other tools. Having more advanced skills with Excel may help you get a promotion at work, and knowing how to create a powerful Powerpoint presentation will definitely add a notch to your resume.